Packed with flavour, these bite-size appetizers are a cinch to prepare. Unroll dough; cut into 16 equal pieces. Spoon mozzarella onto centres of ham pieces. Fold ham over cheese, then roll up. Place 1 roll-up near one side of each dough piece; fold dough in half. Press edges together to seal; place on baking sheet sprayed with cooking spray. Brush with water. Sprinkle with Parmesan. 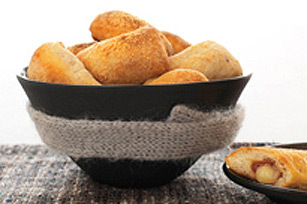 These calzones are great for dipping. Serve them with Kraft Rancher's Choice Dressing or Heinz Dijon Mustard.